A rather uncommon casual wool-alien plant found in waste places such as rubbish dumps. Grows to 1m high. 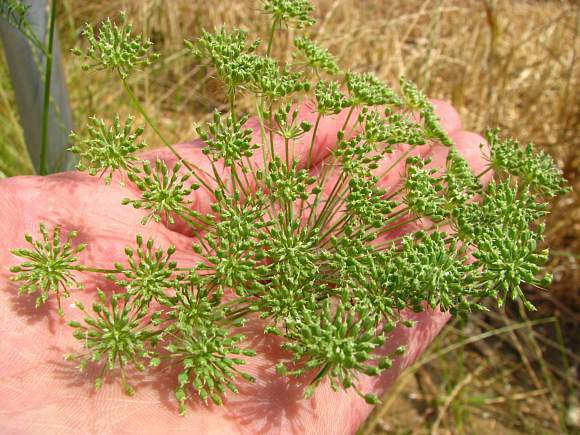 Umbels are compound with between 9 to 40 very thin long (between 3 to 7cm) rays not all equal length. 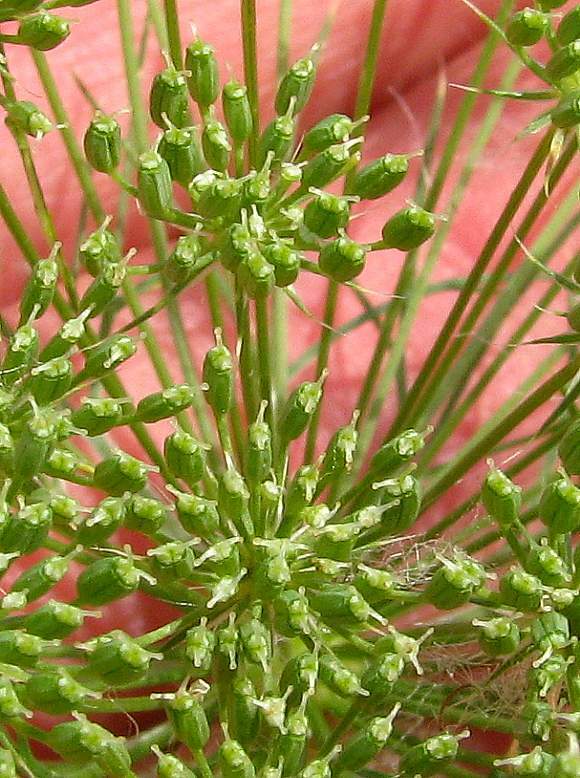 The stalk supporting the umbel (i.e. the peduncle) is longer than the rays. 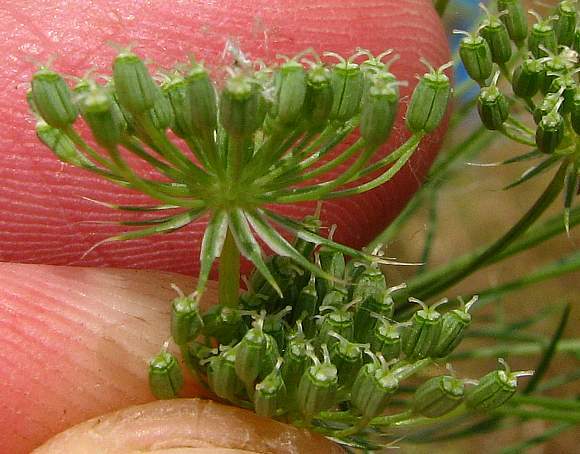 The bracts beneath the main umbel are between 1/3 to 3/4 the length of the main rays and almost wire-like, thin, and divided into 3 about half-way along. 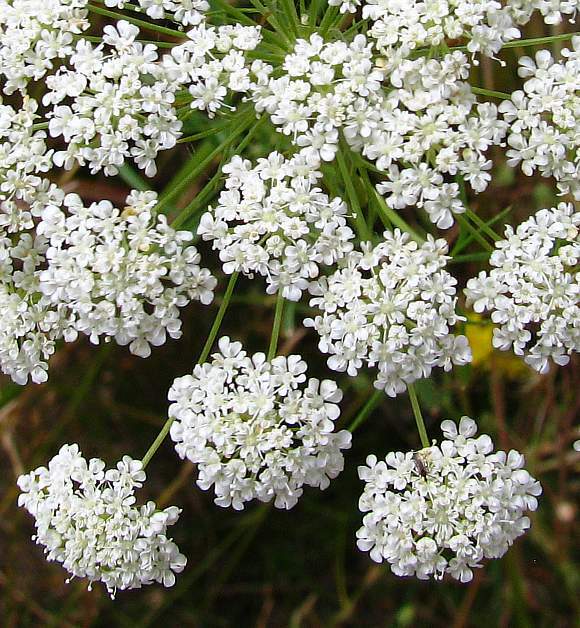 All the umbels have bisexual (aka hermaphroditic) flowers which are white. 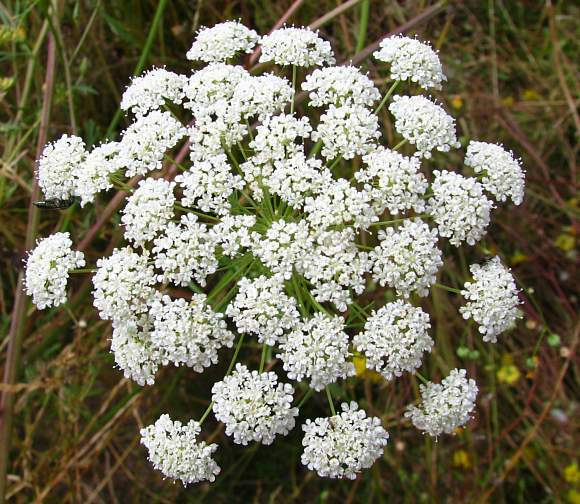 The flowers are only slightly zygomorphic (see those just below right of centre). 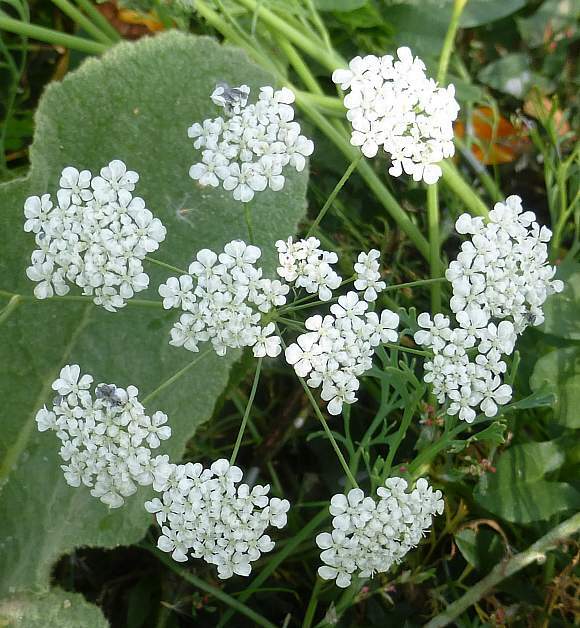 The flowers lack sepals beneath them (not that you would see any from above if there were). 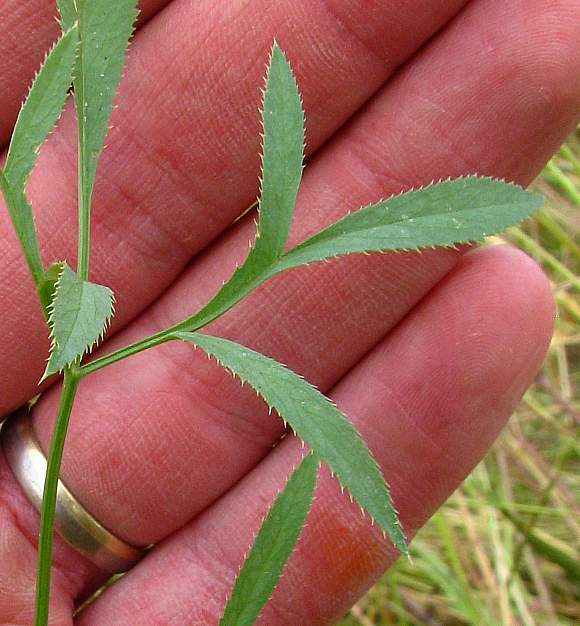 The leaves are very variable. 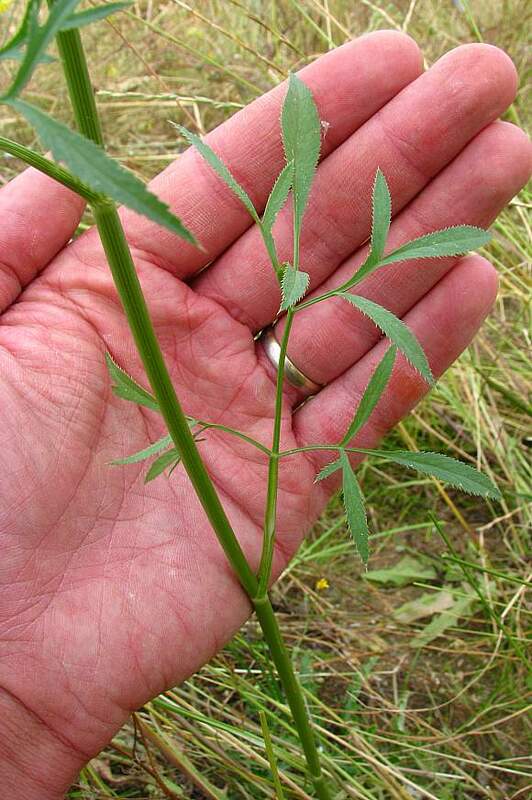 Upper leaves are usually 2-pinnate with lanceolate to linear leaflets which are often deeply toothed and acute. 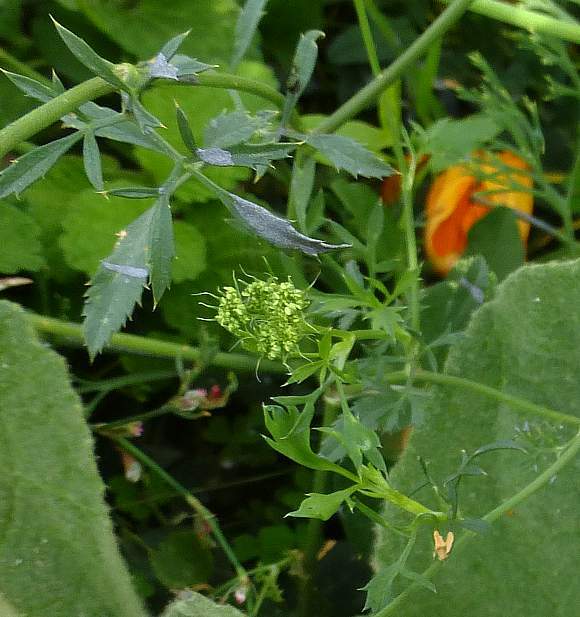 [The large leaves either side are of another plant]. 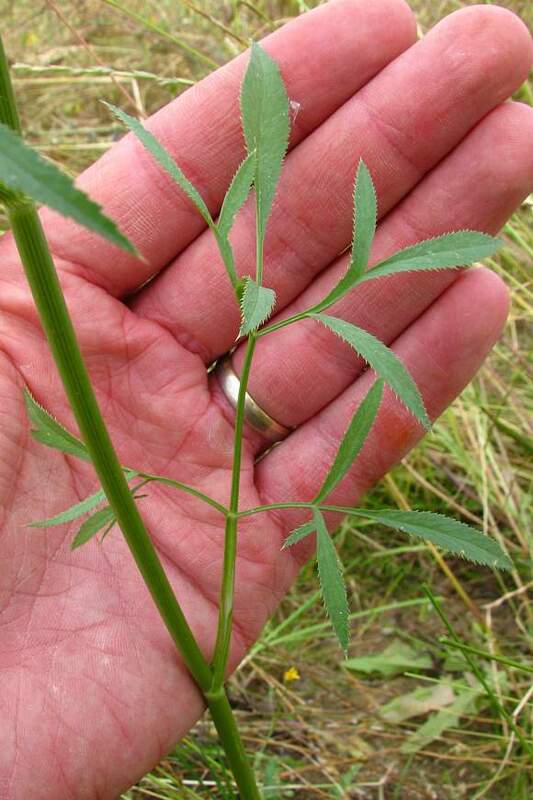 the lower leaves (non visible in these photos) are only between single to doubly-pinnate. Leaves on long grooved stalks like miniature roof gutters. 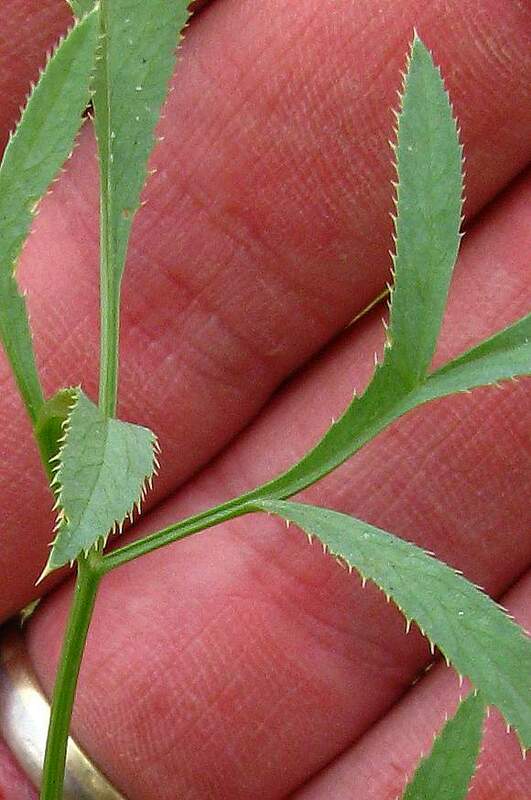 Upper leaf teeth deeply toothed and acute. Leaf stalks with a groove. 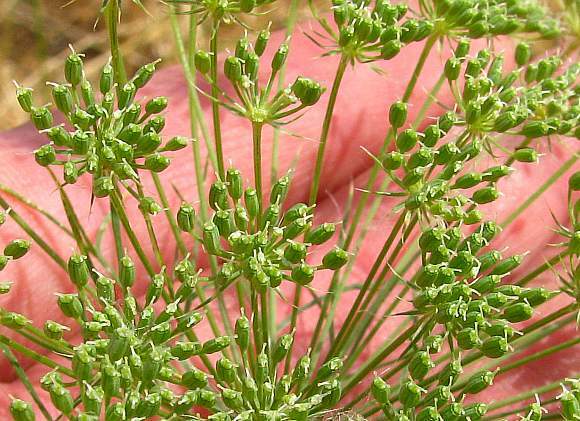 The fruits in compound umbels. Fruits small 1.5-2mm and ellipsoidal in plan. The bracteoles beneath the umbeletts are numerous and usually lanceolatebut with broad thin and straw-coloured edges. The fruit are on thin stalks between 1 to 6mm long and slightly rough to the touch. 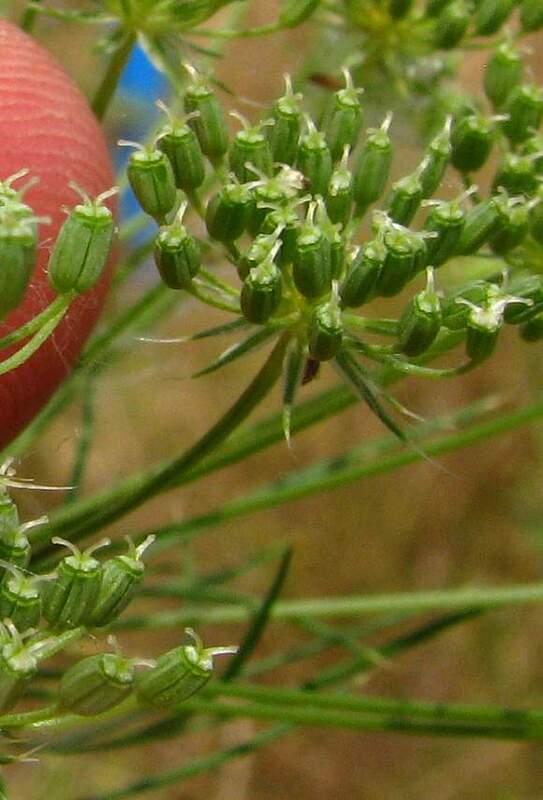 The thin white styles with their tiny globular stigma emerge from the top of the fruit and splay outwards - are about twice as long as the white carpophore they 'seem' to emerge from [see fruit on far left]. The green fruits feel smooth. 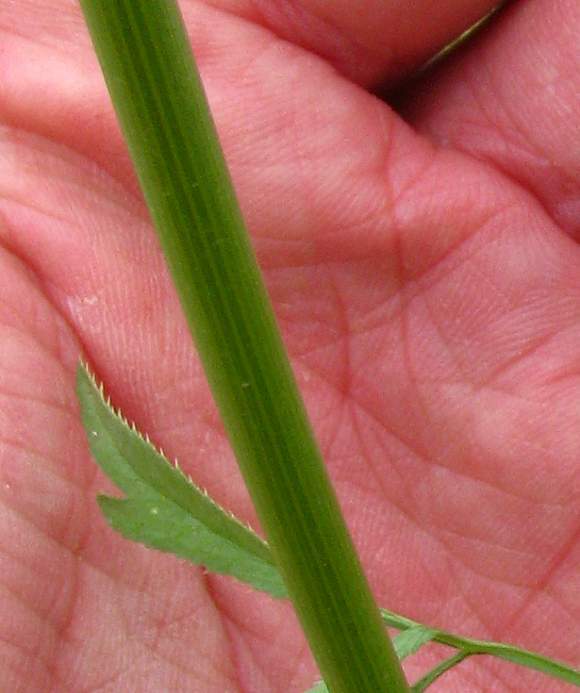 The main stem has many fine grooves or striations along it. 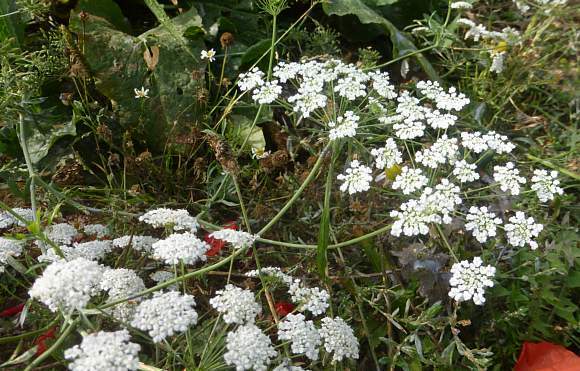 An umbellifer that is not native to the UK and is fairy rare here, (but a 'rare' rating is not counted for plants which are not native). 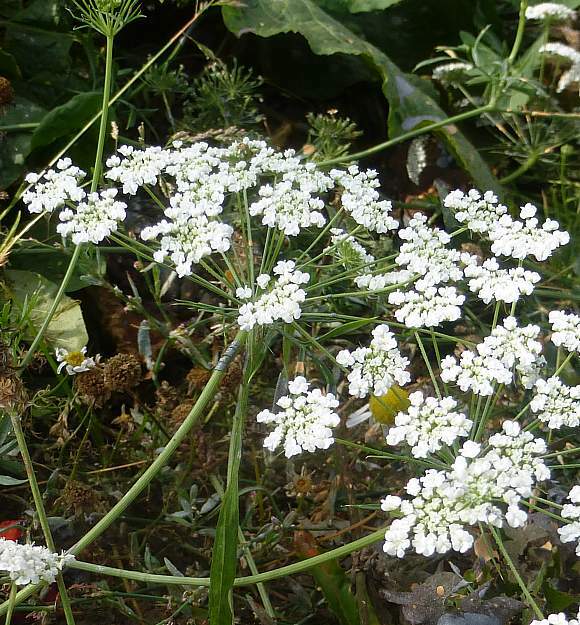 It is an umbellifer. See captions for characteristics.